In recognition of the July 4th holiday, the Milwaukee County Zoo will again offer $4 admission to all visitors on Monday, July 4 (the parking fee of $12 still applies). Families can spend quality time together on the holiday, enjoying all of the attractions the Zoo has to offer. 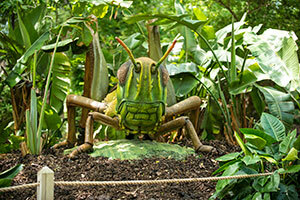 During your visit, be sure to “Bug Out” and meet our flying, buzzing, crawling and creeping new residents – giant robotic insects 200 times their normal size! Now through September 5, visit BUGS! Larger than Life, sponsored by Sendik’s Food Markets, located outside behind our Small Mammals building ($2.50 per person). This travelling outdoor exhibit showcases some of the most interesting and unique insects found on the planet, including an emperor scorpion, a devil’s flower mantis and even a Mexican red-kneed tarantula! See several species of live insects like a red-claw scorpion and Madagascar hissing roaches at our specially designed (aquarium-enclosed) Bug Shack! The Zoo is open from 9 a.m. to 5 p.m. on July 4. For more information, contact the Zoo’s Marketing and Communications Department at 414.256.5466.